For weeks now, social media has been abuzz, discussing a truly perplexing occurrence: all throughout the city, the giant 50th Anniversary cakes plastered on Goldilocks billboards have simultaneously disappeared. 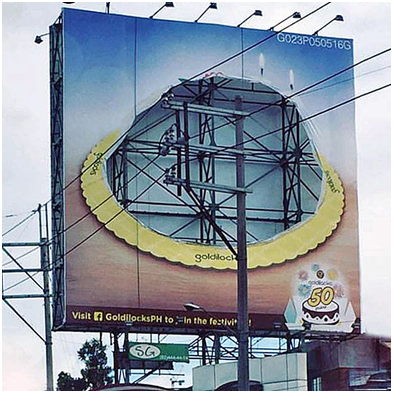 At first, netizens concluded that it must have been an isolated case limited to a particular billboard, but the chatter soon revealed that it was a nationwide phenomenon. Compounding the mystery is that the company itself does not seem to know where their cake went. There were numerous inquiries posted on the official Goldilocks Facebook page (GoldilocksPH) and some even directed their queries to company officials whom they assume can shed little light on the enigma. There is a growing sense of concern and mild panic, as countless Filipino lives have been touched by the country’s best-loved bakeshop over the years. The good news is that there have been a number of cake sightings. In order to encourage people to help join the search, Goldilocks has even offered a cash prize to winning entrants. To join in the hunt, simply spot the missing cake (stay tuned for clues) and take a selfie together with it. You then have to upload it to a dedicated microsite goldilocks.com.ph/missinggoldicake with your name, age, address and contact details on or before June 27. Each participant is allowed to submit up to three photos with a maximum size of 2MB. The draw will be held on June 29, 2016 at which Goldilocks will choose five (5) winners of P 10,000.00 cash and ten (10) winners of P 5,000.00 worth of Goldilocks gift certificate. Will you be the one to solve the great cake caper? Check out www.goldilocks.com.ph and follow them on Facebook or Instagram via GoldilocksPH to learn more about the mechanics of the Goldilocks Missing Cake Promo.